Sorry this time I'm horribly late to announce the theme of this month's Spotlight. I was loaded with work and couldn't get any time to think about the theme. Now that I know, let's announce it without any delay. This is February and February is a month to celebrate iternal love, love in all forms. February 14th, World is going to celebrate Valentine's day and here We are also going to celebrate love. The theme of this month is Valentine's Treat. 1. 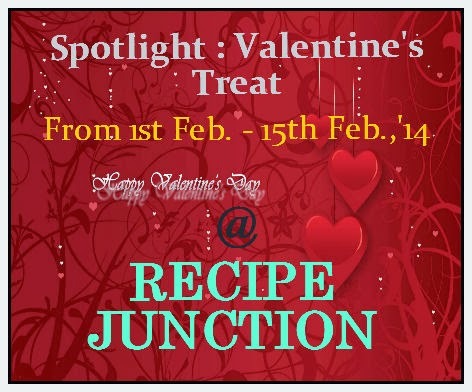 Prepare something special for your valentine and share with us. For that, you don't need to wait til 14th, for lovers everyday is valentine's day. Isn't it ? Veg and Non-Veg. both are allowed. Any cuisine or any course will go. 2. Post it in your blog between 1st Feb,'14 to 15th February, 2014. Archived posts are allowed but repost newly with this announcement link.